The development of Samara University scientists is significantly distinguished in the Russian market of unmanned systems due to the combination of fundamentally new characteristics. One of the main advantages of the "Photon" is independence from navigation systems such as GPS and GLONASS. 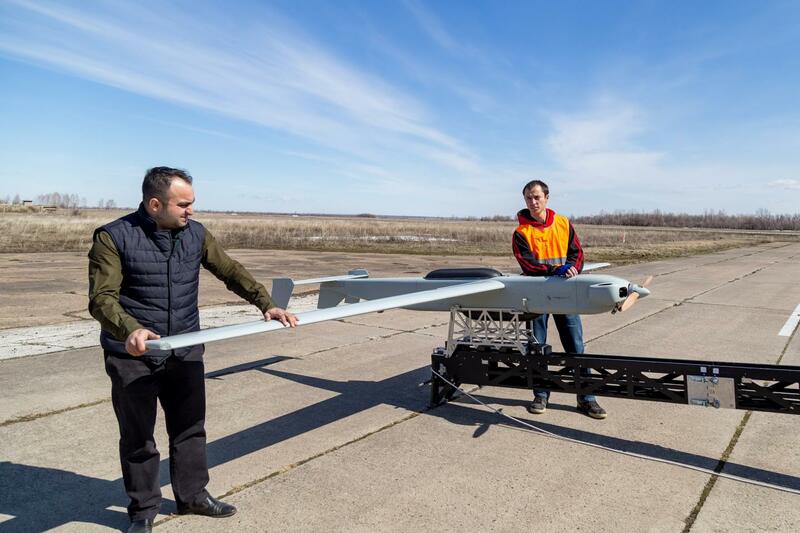 Full autonomy of the UAV provides a built-in alternative navigation unit, developed at the Samara University. The complete autonomy of the UAV is provided by the built-in alternative navigation block developed at Samara University. It is based on the principles of optical navigation. Due to the support points set beforehand along the route the UAV is able to navigate the terrain with the help of "machine vision" and correct the course without the use of satellite navigation signals. According to the developers of the UAV, the autonomous navigation will allow to increase the radius of the apparatus up to 400 kilometers, in comparison with other UAVs and increase its safety significantly. The duration of the flight of Samara University UAV is up to 24 hours. "Now in Russia there are no known analogues to such apparatus. There are many UAVs with different types of the work load, but they are all of exclusively local use", — said Anton Nazarov. During the whole flight control over the most important blocks and joints of the UAV is made from the ground control station. If radiocommunication is lost "Photon 601? automatically returns to the take-off place and lands. If on its way "home" the communication is resumed, the UAV returns to the source route again for the completion of the flight assignment. Herewith the apparatus can be followed both in visible spectrum and infrared band. The UAV has two power supplies, i.e. the solar array system and combustion engine. At present young scientists of Samara University are working to obtain the highest possible efficiency of solar panels onboard the UAV. Their goal is to ensure the flight of the UAV exclusively on the basis of solar energy, which will allow the device to move to a higher level of autonomy (up to 32 hours). Unmanned aerial vehicle "Photon 601? is intended as a research laboratory for running of experiments and is equipped with two types of cameras on gyro-stabilized suspension. On the UAV of Samara University another work load of up to 8,5 kg in weight can be set. In addition the UAV is oriented to the solution of civil tasks, i.e. the problem areas monitoring of oil companies' main pipelines, surveying of hydraulic structures, revealing of unauthorized landfill sites, control of natural resources extraction, assistance in the field of cartography, geodesy. On UAV "Photon 601? developed at Samara University 9 test flights were conducted. The flights resulted in working out of the autoflight mode, modifiability of the route as well as control over the work load (transmission of information and its quality).